Meet sweet little Lu Lu Bear. The idea for this sweet little bear came about after a spontaneous trip to my favorite junk store earlier this week. I found this guy in a stuffed in a box in one of the booths of an antique / junk / thrift store. Sadly he wasn't on a shelf displayed nicely. Apparently the booth owner didn't think he was worth very much and left him laying in a dusty box marked "all box 50 cents". I spotted him and loved him right away. He's made out of an old quilt and backed with muslin and has oodles of vintage charm. At another booth in the same store, I found piles of vintage fabric for $1.00 a remnant. 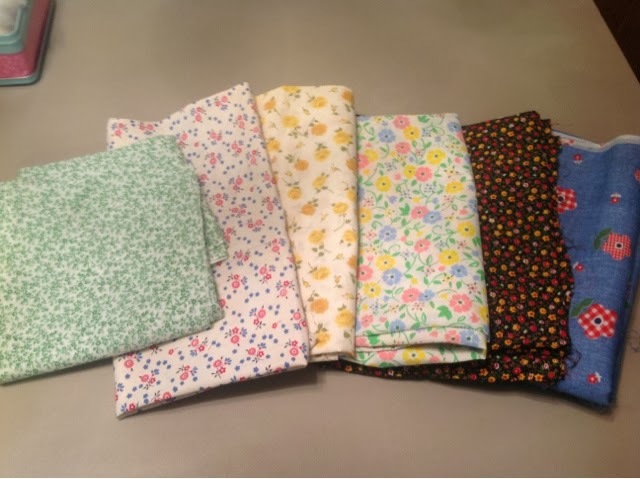 The nice thing is some of these have way more than a yard on them. 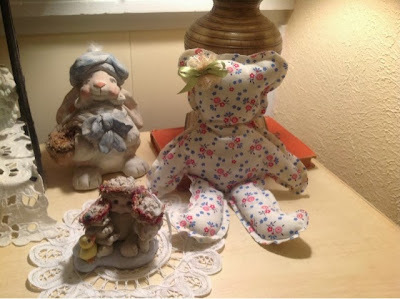 I picked out a few pieces with the idea in mind of bringing them home and attempting to make more bears. 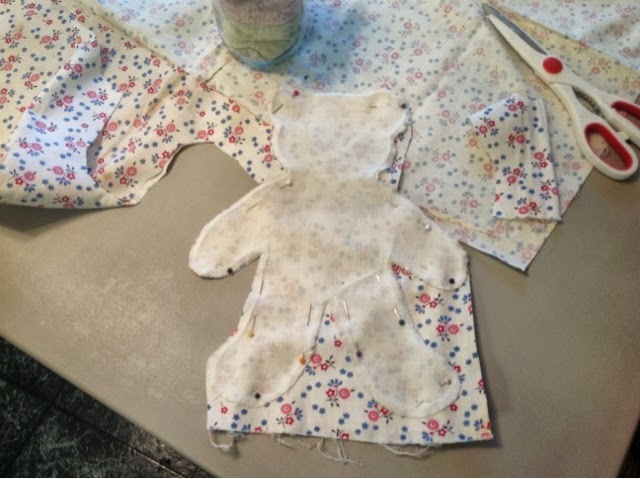 I wanted to just trace out a pattern but I had a hard time getting a good form. 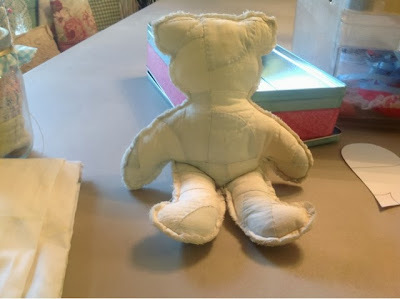 I ended up having to unsew the bear and used the backing as the pattern. 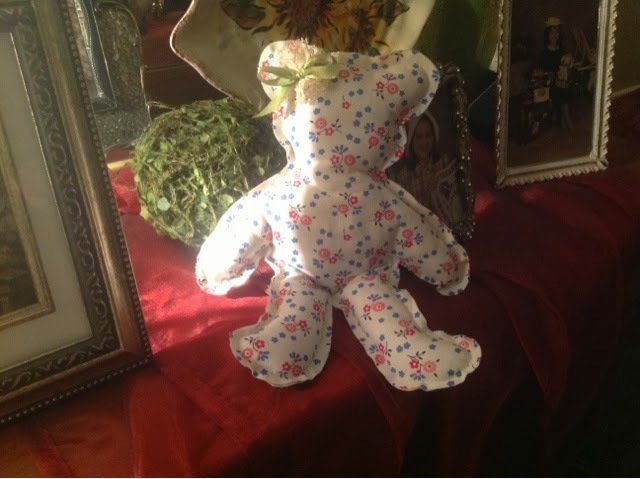 I really didn't want to do that but I'm thinking I can sew it back up once I trace it and get a good template. Here she is all stitched up. I still have to clip around the edges and throw it in the washer to fray the ends but I was a little impatient and had to get quick photo of it. I was undecided about embroidering on a face. The original one didn't have one. I don't really think it needs one but who knows, I might add one to the next one I make. 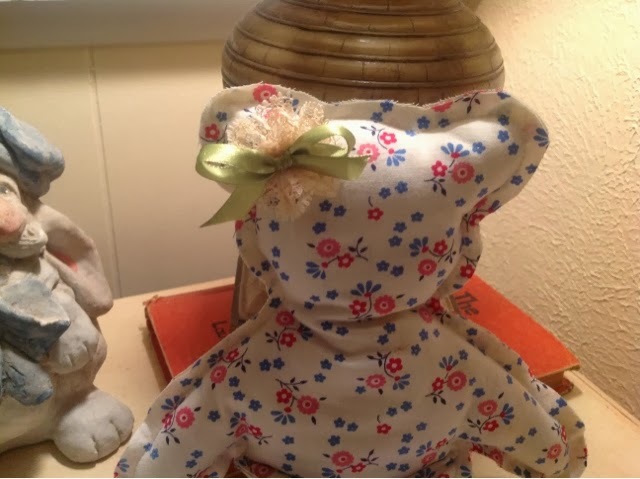 You are so creative to think of taking that bear and making more, even prettier little vintage-looking bears! I love her! She's so sweet! I wish I had been shopping with you at that store. I love to look around places like that. So fun, and even more fun when you find things like that bear and material. What a sweet little calico bear!